❸❺ - Old Davisville LCBO - 1945 Yonge St - ??? ❺❸ - Future Shop Site - 2400 Yonge Street - Condo? The Yonge and Eg thread is too specific to that intersection and the nearby retail so how about a thread for the whole Midtown area of Toronto? Let's discuss the rapid growth and intensification of this lovely part of the city and communally yell at the downtowners for thinking we are some suburb and at the suburbanites for clogging the Yonge line by the time it arrives at Eglinton station! So what exactly are the boundaries of Midtown? Midtown is a comparatively newer re-branding as before amalgamation it was divided between the northern part of the old city of Toronto as well as parts of North York, York and East York as well. With amalgamation these borders were erased and now these areas find relevance with each other as Midtown and through economic centers along Yonge between St. Clair and Lawrence than with their old municipalities. Naturally this results in rather ambiguous borders. I myself consider Bayview to be the eastern border of Midtown, between it and Leaside. What are your thoughts? We aren't a post-war suburb, which is what some people mean when they say "suburbs", we are a streetcar suburb, which is a much better thing to be in my opinion. For those who aren't familiar with the term, streetcar suburbs not places that currently have streetcar service (many were replaced by buses or subways), they are early suburbs that were developed around the new streetcar lines built around the city, allowing people to live farther than ever before from the downtown core. This is before cars were popularized, and often before streets were paved. In fact a large part of what we consider to be "downtown Toronto" are streetcar suburbs: The Annex, Yonge St from St Clair to Lawrence, the Danforth, Bloor West, St. Clair West, areas East & West in downtown. I actually took a class on Toronto's architecture and did my project on the history of what we're calling "midtown" now. There were three nodes of small villages at Davisville, Broadway/Montgomery and Lawrence Park. The Starbucks at Davisville is still the original building that was there back when that area was first settled, it was the store & post office of John Davis. 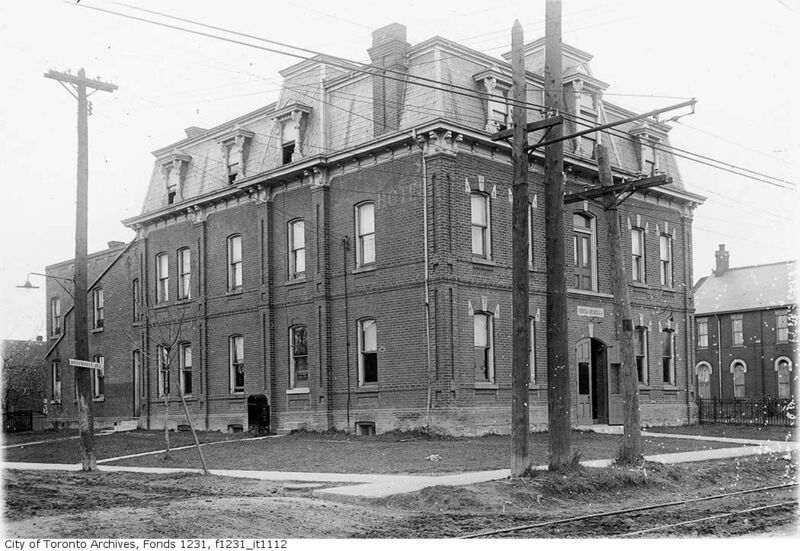 The three towns formed a larger town called "North Toronto", and there was a streetcar line running down Yonge St. Eventually North Toronto joined Toronto since it needed better utilities & transit. Oh yeah and for borders, I'd go with Yonge Blvd (the old Toronto's northern border), Avenue to Bayview, and maybe Mt Pleasant Cemetery in the south, since I think Yonge & St Clair is its own area. You get to see the now-abandoned bus bays with trolley-buses. Nice write-up. That definitely helps establish context to why our part of the city is the way it is and not like the post-war suburbs. Yonge Blvd seems a little far north than what I typically think of. Lawrence/things north of Sherwood&Blythwood Park itself seems like a stretch. And thus the controversy begins. What do you think of Forest Hill and Deer Park? They alongside with Leaside are pretty nearby. Depends overall how large are we defining Midtown Toronto as; is it a neighborhood or a whole region or subsection of the city? I've seen this before linked on reddit, one thing that gets me everytime though is how the bus terminal has remained unchanged in all this time. Speaking of which, it lies on a potentially very valuable piece of land near Yonge and Eglinton and its lease with the TTC is up soon making it biddable by developers and surely an attractive spot for development. It will be interesting what happens there, I hope it is more office towers. Yonge and Eg needs office development in addition to condos if we want to make the intersection a hub comparable to downtown. Yeah I find history fascinating when it explains the way things are now. If you're interested in the history of the suburbs and how various transit technologies changed the way cities were built in North America, I'd recommend "The Geography of Nowhere" by Kunstler (it's a depressing read though). I wish there was a class on the history of transit but so far I haven't seen one. If you're interested in the history in the area, I think the place is the Northern District library's local history section. I don't think there is much online. The North Toronto historical society can have interesting free talks sometimes, but if you're under 30 like me, be prepared to be the youngest person there . Yeah, there are some nice restaurants & coffee shops up there north of Lawrence so I included it . Lawrence Park is definitely it's own neighbourhood as well though. I walked around Forest Hill for the first time I think last summer and was amazed. I feel like you definitely know you're in Forest Hill when you're in it. You've got sculpted bushes, fountains, sports cars and security cameras everywhere, it's unbelievable. The houses are quite different too, even the more modest ones. There is barely anyone walking around and due to the security & fences, you feel unwelcome. The restaurants near or in Forest Hill on Eglinton and St Clair look really nice, but I haven't really tried them yet. Some of the restaurants and the area has recently become famous because Drake the rapper went to high school & lived there. I was hoping that Yitz's would be good, but the smoked meat sandwich is definitely not as good as Caplansky's. It's also amazing how the character completely changes again once you cross Allen Rd and you're in Eglinton West, little Jamaica. Leaside, I like Bayview's commercial street. I hope the big-box stores are re-developed, which I think they will be after the LRT is completed. Although, I admit I have shopped there . To me, it's too far from the subway, I prefer to be within walking distance. The ravine & parks in the area are great. They (our councillor Matlow) are pushing for a park or some form of public space, which would be nice. Condo developers give money to the city in order to build more floors for each proposal, and I think that a lot of the recent ones that were approved near the area had money committed to creating a park or something public there. I know there's Eglinton Park, but it's far removed from the vibrant intersection. The main problem with the square that was there earlier was that it was designed to repel people rather than attract them and get them to stay. They could've easily made it friendlier by putting more trees, food vendors and seating & tables. The same thing happened in midtown Manhattan when the city forced office developers to build public squares. They made boring concrete squares with no where to sit. I bet anything that if chairs, tables, and some food vendors were put there, tons more people would've used it. The bus bays will be used to extract the tunnel machines, so it will be a construction zone probably for the next 6 years. The middle of the street will be dug up as well for the station construction. Worth it though! Thanks for creating this thread. Now I have a place to complain about lack of coffee choices and local issues without disrupting threads! Ahh good 'ol "midtown." You're right in that there really isn't a clearly defined boundary as to what most people consider as midtown. Personally, I tend to associate neighborhoods as midtown if they fall more or less within: Bathurst as the western border, Bayview as the eastern border, Bloor as the southern border and roughly Lawrence as the northern border. 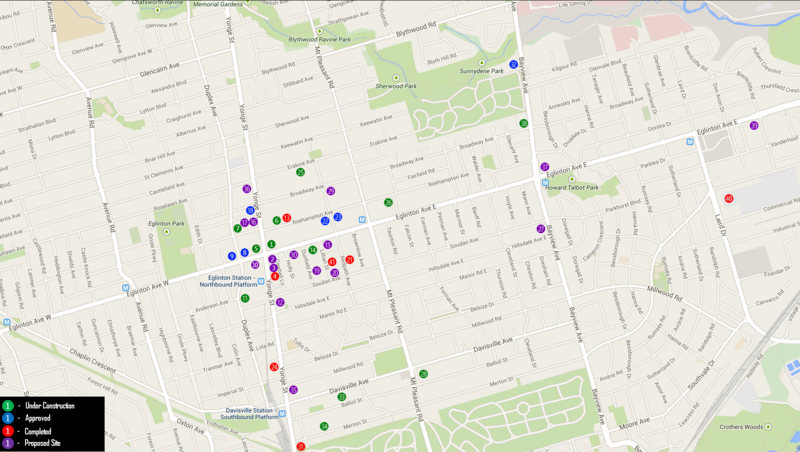 If we only consider Leaside to be the area between Bayview and Laird (discounting Thorncliffe Park) then I would consider including Leaside in Midtown as well, if we are going for that large a definition of Midtown. Dunno, Leaside being part of East York always felt strange to me. I get it is because Leaside was a village-town originally and it amalgamated with East York but to me East York has always been the area east and south of the Don River, the Danforth, Leslieville, The Beaches etc. Definitely there needs to be significant public space or a park in the area. The TTC owns the land and I've read that already the City is not happy that the site is in such an eyesore and the TTC has made no effort to at least put up temporary walls to hide it. Typical Toronto - no regard for the appearance of the city. At the very least it should've been made into a parking lot in the mean time. At least then it would be both an eyesore and serve functionality instead of being a complete waste of space. there are structural issues, maybe that would prevent anyone from using it. If we were able to use the space I'd prefer they set up food trucks or something than a parking lot. They could've moved the farmer's market there for example, if it were safe to use. At this point, there isn't a point to using the space since it will be used for the tunnel construction very soon.